Today my world changed a little bit. My friend Rob asked me to write a fun application: You answer some questions and it tells you something, fairly simple. But he wanted to put it up his blog… oh-oh… Well… I am not much of a network- or server-guy and he runs a WordPress-blog on a hosted linux maschine, so .NET wouldn’t work. I started thinking about HTML-forms and java-script stuff but I don’t think it works too well with blog-posts and – by the way – I hate that sh*t, so I dropped it after one second. Then I thought about Flash and I guess that’s what you would use for a little game like that. But I don’t have it, I don’t want to buy it (is there a free version?) and I don’t have the time to learn it; although I think it’s pretty cool. But… wait a moment? What about Silverlight? Isn’t it similar to Flash? I checked it out and I tell you: No, it’s not. Or nor yet. I downloaded the SDK, played a bit, read some pages. But… it’s just not the way you want it to be. Works only with java-script, isn’t easy, needs a lot of learning, doesn’t give you any moments of success. It’s just no fun. So I complained in a chat with Benjamin. "Do I have to write a .NET-to-Flash-converter first?" He said: "There is one." – "WHAT?" – "Yes, I heard about something like that." and a minute later he produced a link to a product called "Goa Winforms". I could hardly believe my eyes. They claim to have an engine to compile .NET-Winform-Code to Flash (.swf) applications. The basic version is free and comes as a 3MB installer, which integrates the tool smoothly into VS2005. After installing VS comes up with new project-types. I choose the GOA Application and VS prepares a solution with a new project and a file that looks like a regular C#-file (the extension is .ccs by the way). Okay, let’s start it… Wow! A real Flash-application comes up. So far it’s just an empty form with one button – but it runs. It runs!!! I think they implemented most of the common gui-components for flash and engineered a compiler that somehow converts C#-Code into an flash-interpretable format. Cool achievement! Now, let’s design a fancy gui… but… were is the designer? In brief: There is none. You can’t design the gui as you usually would. Ouch. Okay, there is a solution to this ‘issue’, but it hurts and can’t be more than an temporary workaround: Add a Windows-application project to your solution, design your gui and copy the generated code to the GOA-application file. Done? No. When you try to compile it, you get a bunch of errors and you have to manually delete any usages of properties that have been generated but are not supported by the GOA-version of the corresponding controls. Now it works and you can continue to write your logic… but that takes us to another annoying point: The integration to Visual Studio could be improved a lot. Syntax-highlighting and intellisense work, but that’s it. Auto-re-indentation doesn’t work, errors and warnings do not all occur in the "Error-List"-Window, and my loved ReSharper didn’t recognize the code; but maybe that’s just because of the extension .css – is there a way to make ReSharper recognize those files as regular C#-files? Please let me know. That’s was a lot of bleating, but lord don’t let me be misunderstood: It’s works and you get a lot for your effort; I had the fun application for Rob done in three hours (including learning, fighting, reading) and I am happy with it. There is a lot more to play around with – like dymanic creation of controls – but it should be fine for the most purposes. 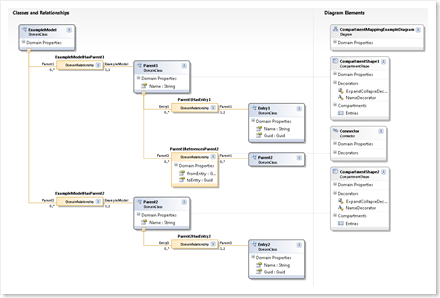 Each element you can see in a DSL Diagram within the DSL editor is based on a Domain Class defined in your DSL Definition. If the user selects on of these shapes in the Editor he can change the values of the defined Domain Properties in the well known Properties Window of Visual Studio, but only Properties declared at design time will be shown in the Properties Window. For some reason I want to change the number, name and type of the properties at runtime. E.g. some code will add some properties to one shape while the user works with the DSL model. 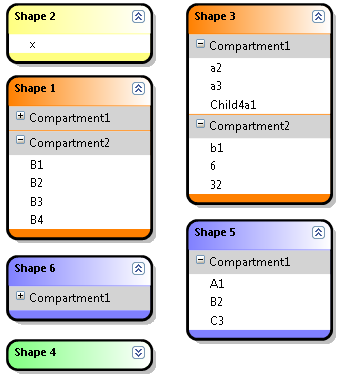 Different shapes based on the same Domain Class should be able to display different properties as well. Such a behavior is not support by the DSL Tools in the current version, so I build a small library as a workaround to provide this functionality. As I know some of you have a similar request, I will explain my approach here, and of cause publish the sourcecode of my library below. I designed a new Class DynamicPropertyCollection which is a container of all new added properties. You will add a Domain Property of this type to your Domain Class at design time and then you can add more properties to this collection at runtime. I will care for showing these properties in the Properties Window. 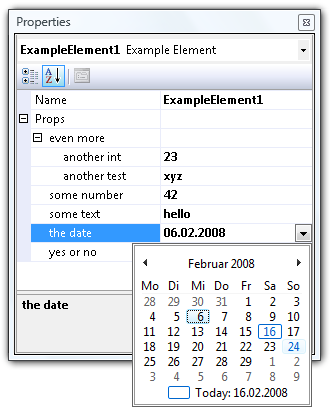 There are two additional properties hidden below the even more row and as you can see, all user interface features like the calendar on DateTime values are supported out of the box (all this comes with the great properties grid control). Maybe you can claim I did not really keep all my promises because I did not add additional properties to the Example Element rather to using these sub properties. That’s right, but I think it’s very close and there are many advantages with this: You do not need to add code to the Domain Class, the Shape or anywhere within the generated classes and you can only use my DynamicPropertyCollection class as a black box (although I try to whiten it here a little bit). How does all this magic work? The trick comes with the ICustomTypeDescriptor Interface. Normally the properties grid will use reflection to access all public properties of a class and shows these properties in the grid. But if you implement this interface the grid will ask you for a list of all properties in a PropertyDescriptorCollection. This question I can answer with another list of properties each time and so I can show dynamic properties for each element. In my code you find a DynamicPropertyCollection class that implements this interface and uses for most methods a default implementation, but some special code for public PropertyDescriptorCollection GetProperties(Attribute attributes). Internally there is a private readonly List<DynamicProperty> properties that contains all these properties. 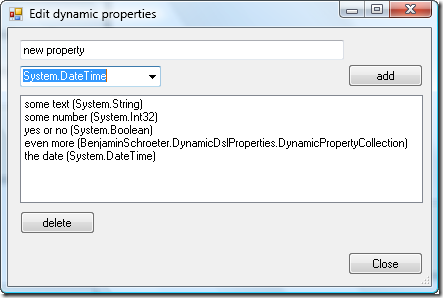 The DynamicPropertyDescriptor objects returned by GetProperties() contain every information the property grid needs to show the list. Further more it will delegate get and set operations for the properties to this DynamicPropertyDescriptor which stores the values in the underlying DynamicProperty objects. With this few classes and only few lines of code you get the properties shown as in the screenshots above! The DynamicPropertyCollectionTypeConverter inherits from ExpandableObjectConverter to provide the expandable functionality in the properties grid, but all the other code is used for serialization only. I have to provide Code to convert from and to string. 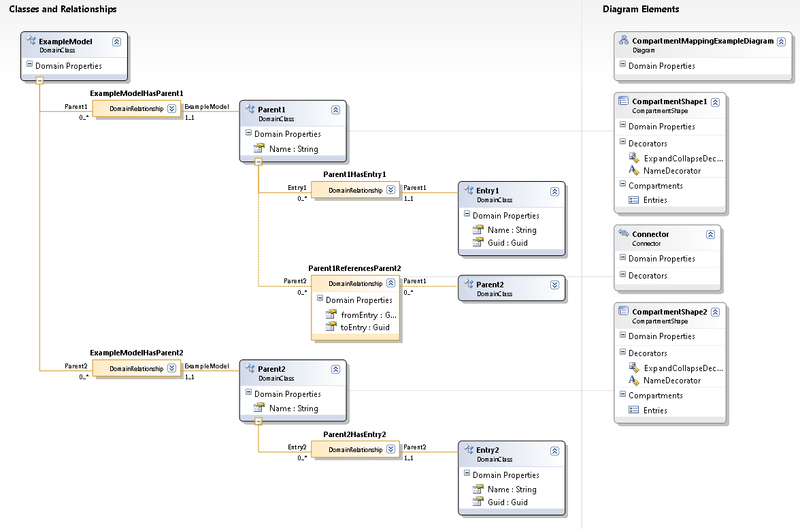 In my string representation I have to store all properties with there name, the type and the value, of cause. To store the different values I use a TypeConverter and convert the objectvalues to string as well. So you can only use types that can be converted to and from string, but that are all types most people use in the Properties Window since the user can only type and see strings there. name_3="yes or no" type_3="System.Boolean" value_3="True"
As you see, it is still human readable. Compile the DynamicDslProperties code as a library and add a reference to your DSL project. Maybe you want change the key file for signing. 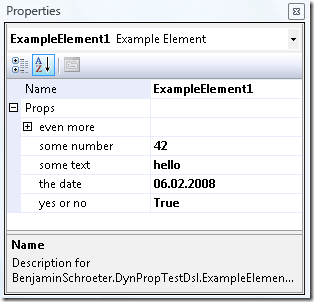 In the DSL Explorer you have to add a External Type with Namespace = "BenjaminSchroeter.DynamicDslProperties" and Name = "DynamicPropertyCollection". Now you can add a Domain Property of type DynamicPropertyCollection to any Domain Class. Change the Default Value of the property to " " (one space only). This is crucial to initialize the class on creation of new Domain Elements! Otherwise the new Domain Element will have a null value for this property and you must handle it at various places. 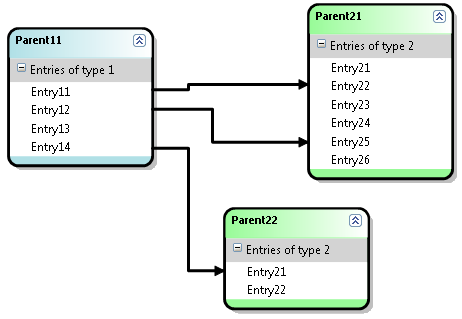 In the DSL Explorer look at the Xml Serialization Behavior of the property of this Domain Class and change the field Representation from Attribute to Element. This step is optional but provides you a much nicer XML representation. Add somewhere code to add properties to the DynamicPropertyCollection. Remember to wrap this and all changes to properties in a transaction. For a fast jumpstart and to test the features I provide a small dialog to add and delete properties. You can simply add some code to a shape to open this dialog on double click. Of cause this window and the DoubleClick event are only good while debugging and testing. For real world projects you will use the public interface described above to add and remove properties. In the zip file you will find the whole sourcecode of the described library to use in your projects. Just leave my copyright and the link to this article in the header of each file and do not expect any warranty. If you extend the library, find or fix some bugs I would appreciate a comment here. There is also a whole DSL project in the zip file to try my code right away. Be careful when sorting lists of structs!! It’s a simple class that implements IComparable; Items are compared by the return value of the method GetSortkeystring. GetSortkeystring returns the variable ‘string sortkeystring’ and – if sortkeystring is null – initializes it with the .toString()-value of a random number that was to the constructor of the calls when creating the object. Don’t look at the code too critical; it’s just the shortest code to illustrate the idea. In our real case the initialization of the sortkeystring is a very costly method that you wouldn’t want to call more often than absolutely necessary. Now lets just get 100 random items und have them sorted. What would you expect as output? Right. Now lets make a little change and turn the class into a struct. What would you except as output now? The same as above? Dude, you are dead wrong! After sorting. ctor_counter 100, getsortkey_counter 770!!!!! Can you believe it? Neither couldn’t we and it took Benjamin a while to track it down. What is going on here? I didn’t know, so here is my first theory: The sortkeystring must be null again and again, since there is no other way to increase the getsortkeycounter. Doing the .Sort, .NET seems to create new instances of fancyitem all the time, which makes perfect sense: sortings objects is all about pushing around pointers, but structs are not "pointered at". So their real values have to be taken out of the list und put in at an other place in that list. But why does the value of sortkeystring get lost somewhere. A bug? May I confuse you more? Let’s try something else. In the example we initialized the sortkeystring as late as possible (lazy loading – remember. it’s a costly, costly method). But, come on, for the sorting we need each sortkeystring anyway, so why no initializing it in the constructor? The getsortkey_counter is gone, sortkeystring gets initialized in the constructor and GetSortkeystring() throws an exception if the value is lost. The result was unexpected to me again. I was prepared for an exception, because we saw that the value gets lost. But no exception occurred. the constructor of the struct is officially called 100 times in all cases. Fine. the GetSortkeystring()-method is called a lot. For each comparison. Fine. in the first example the value of sortkeystring gets lost and has to be re-Initialized. Not fine but we have to take it. in the second example the value of sortkeystring is initialized in the constructor and does not get lost. Fine, that’s what one would expect. reference types get lost like sortkeystring in the first example – as long as they are not initialized in the constructor. Is there a kind of protection for variables, that are initialized in the constructor? I can’t believe that. Ups… call by value. Now ‘other’ is of course just a copy and sortkeystring gets initialized in this copy – which does not affect the original in the list at all. And next time an original is compared… Do I have to say more? Very satisfactory, I even don’t have to wake up my girl-friend! Good night, guys!